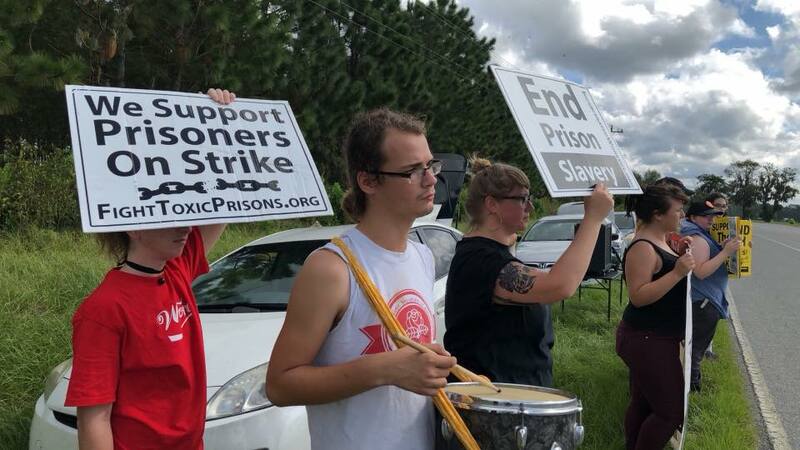 The Party for Socialism and Liberation Tallahassee agitated around the community throughout the entirety of the August 21 National Prison Strike in solidarity with our incarcerated comrades. The PSL Tallahassee planned three separate events throughout the course of the strike to draw attention to the ten demands deliberated and decided upon by incarcerated organizers. On Saturday, August 25, a group of about 15 activists met in front of the Florida Department of Corrections building in the summer heat to honor the lives of the seven inmates killed in the violent clash at Lee Correctional Institution in South Carolina: Corey Scott, Eddie Casey Gaskins, Raymond Angelo Scott, Damonte Rivera, Michael Milledge, Cornelis McClary and Joshua Jenkins. The group laid handmade wreaths at the steps of the FDC building with pictures of our seven slain comrades. 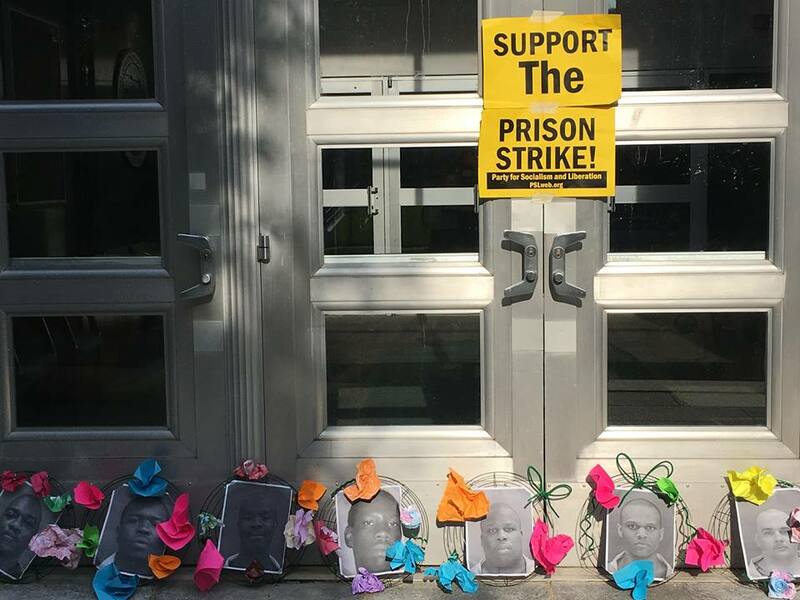 The vigil commemorated them and all the victims of the deadly prison-industrial complex, including the 145 people that have died in Florida prisons between the months of January and April of this year. 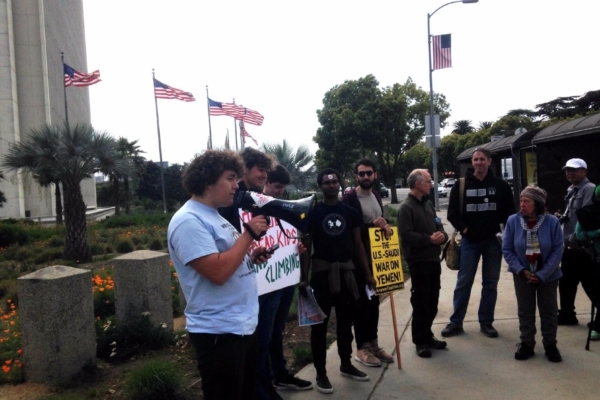 The group shared reflections about the U.S. carceral regime, its connections to the police state and Immigration and Customs Enforcement. The point was driven home that prisoners are among the most marginalized in our nation, and that there is hardly a less dignified existence than to live and die in a cage. The activists then relocated to the intersection of Calhoun St. and Apalachee Parkway, in front of Florida’s Old Capitol building. 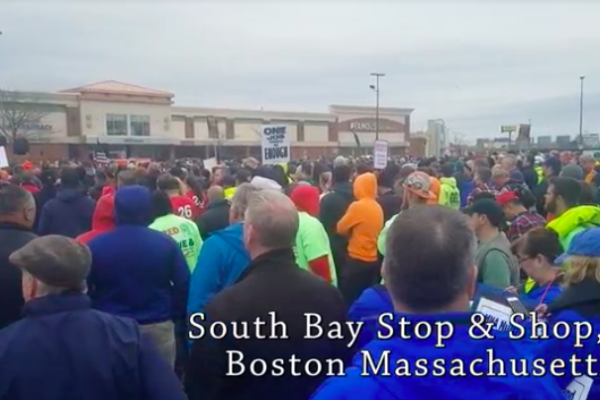 Standing in four pockets on each corner of the busy intersection, they shouted messages of solidarity towards traffic, attracting a variety of reactions. Waving signs and banners with phrases such as “End Racist Mass Incarceration” and yelling chants such as “prisons are violent, we will not be silent!”, outside supporters raised awareness about the National Prison Strike. Many Tallahassee residents honked their horns in support, showing that solidarity is there amongst the masses — it is simply a matter of calling them to action. Pierre, alongside about 20 other activists, reconvened the following week on Saturday, September 1 outside the ICE detention center in Crawfordville, FL to continue demanding the abolition of both prisons and ICE. The September 1 Abolish ICE rally organized by PSL Tallahassee had been planned prior to the National Prison Strike, shortly following the nationwide Families Belong Together protests on June 30. However, after speaking with some comrades affiliated with the Incarcerated Workers Organizing Committee and Fight Toxic Prisons in Gainesville, FL, PSL Tallahassee made the conscious decision to reframe the event to draw attention to the National Prison Strike. Protestors stood outside the work camp, where ICE detainees are sent to perform backbreaking slave labor. They held ten signs, each one listing one of the ten demands of the strike. PSL organizers gave passionate and inspiring speeches, reminding attendees of the intrinsic relationship between ICE and the greater carceral regime. This relationship is understood by the incarcerated organizers of the strike, who called upon ICE detainees to join the fight. Many have heeded the call, and organizers spoke about the ongoing struggle at ICE’s Northwest Detention Center in Tacoma, Washington. Prior to August 21, 200 detainees announced their intention to launch a hunger strike. Organizers released a handwritten set of demands, both in tandem with the ten demands of the National Prison Strike and also specific to their plight at NWDC. Their three major grievances included a lack of adequate and immediate medical attention, insufficient food portions with little nutritional value, and no access to family visits, including for pretrial detainees. 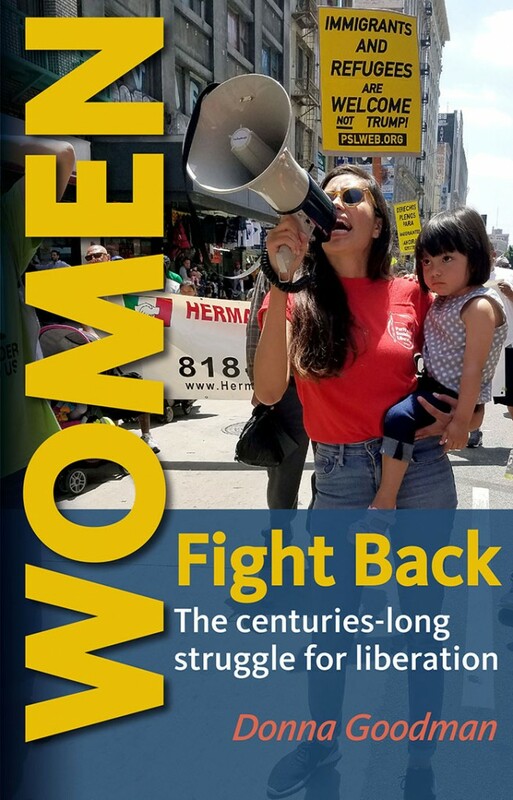 ICE officials responded with heavy retaliation, threatened detained mothers that they would be locked in a different facility away from their children if they followed through with the hunger strike. On August 21, amidst serious repression, 70 courageous detainees launched their hunger strike; four have reached two weeks without food. 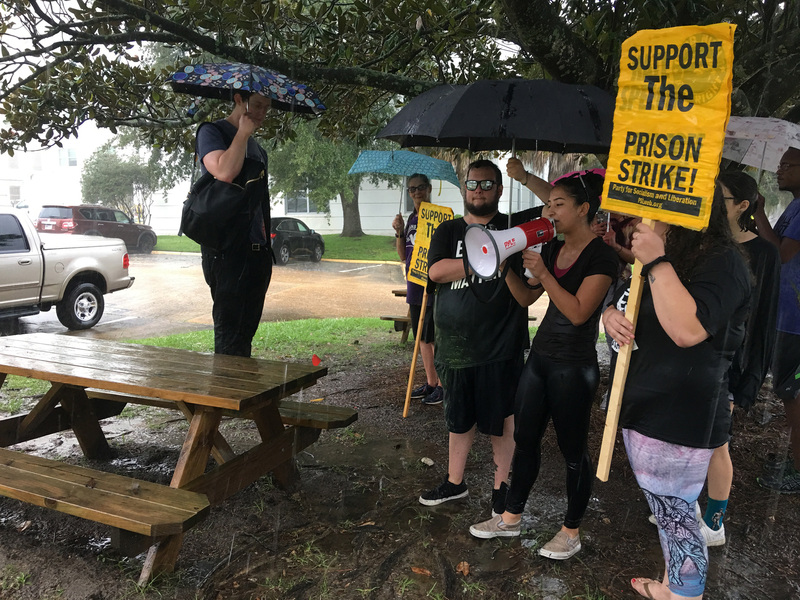 It is unclear whether or not the detainees in Crawfordville, FL heard the call for a National Prison Strike. 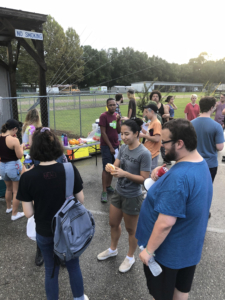 Regardless, PSL Tallahassee affirmed their support for all those kidnapped and disappeared by ICE, from Crawfordville to Tacoma. 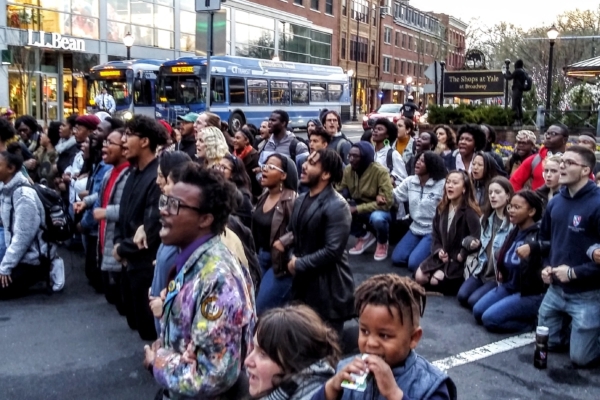 Protestors were implicitly pressured to disperse by cops, who showed up during the demonstration to conduct surveillance and continue the centuries-old US tradition of police intimidation. One cop walked up to the protestors, insisting on taking photographs of the signs that read the ten demands. Under instruction of present PSL leadership, protestors covered their faces with the signs so as to protect their identity; however, it is likely he had already violated their anonymity by taking photographs with the dashcam. However, the protestors remained unfazed and began to chant in solidarity with prisoners and ICE detainees, and in opposition to the police state. “No justice, no peace, no racist police!” echoed through the trees while the cop called for backup. Even as three vans parked themselves only a few hundred meters away from the demonstration, the outside supporters of the National Prison Strike remained undeterred. The protestors outlasted the police surveillance, cheering when the vans finally drove away. As a result of the surveillance, organizers with PSL Tallahassee assumed there would be even greater police intimidation at the next event — an assumption which proved correct. 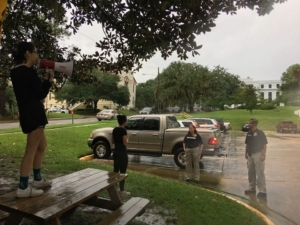 On September 4, a small group of protestors led by PSL Tallahassee descended upon the Florida Department of Corrections building again, this time insisting they be let inside to speak with Secretary Julie Jones, or any FDC representative who would listen about the ten demands of the National Prison Strike. The demonstrators were locked out as the clouds overhead rumbled and the rain began to pour. At least five cop cars were posted on the street; however, neither the rain nor the cops deterred the outside supporters of the Strike. Instead of giving up, the protestors circled the building and stood near the parking lot in an attempt to intercept FDC employees as they clocked out of work. 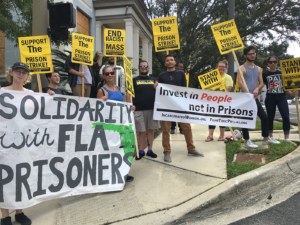 As employees left the building, each personally escorted by a posse of armed cops in bulletproof vests, the activists shouted the ten demands, commanding them to take it upon themselves to end prison slavery, improve the conditions of Florida prisons, reinstate rehabilitative programs and restore the right to vote for all currently and formerly incarcerated individuals. 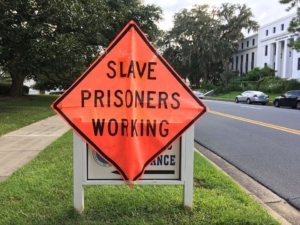 The protestors insisted that the FDC could no longer deny the existence of the nationwide prisoner-led movement, as Jailhouse Lawyers Speak had recently confirmed strike activity in five Florida facilities: Charlotte Correctional Institution, Dade C.I., Franklin C.I., Holmes C.I. and Apalachee C.I. Instead of acknowledge the Strike, the demands, or the outside supporters, the FDC representatives continued to fearfully scuttle to their cars with their cop bodyguards. 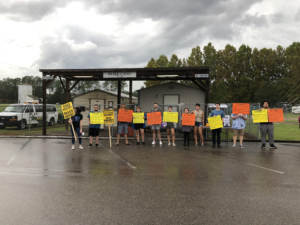 On September 9, members of PSL Tallahassee drove to Jasper, FL to demonstrate outside of Hamilton Correctional in solidarity with inmates resisting the brutality and inhumanity of the prison-industrial complex. The noise demonstration was organized by IWOC Gainesville and the Campaign to Fight Toxic Prisons; organizers and activists from the Tampa Bay DSA and Occupy ICE Tampa also came to show their solidarity. “I went to Hamilton Correctional Facility because I want every single inmate to know that we on the outside will eternally and collectively work to bring America to trial for the crimes it commits against the incarcerated,” said Reem Zaitoon, a member of PSL Tallahassee. Organizers projected their cries through a blaring microphone and amplifier; there is no doubt that the sound pierced through the walls of Hamilton Correctional. Demonstrators banged on drums and hollered into their megaphones, the cacophony of sound accompanying an extensive playlist of anti-cop and anti-fascist anthems. They announced that we had heard about the uprising at Hamilton, and regardless of whether it was connected to the National Prison Strike that we want to support them through their continued struggle. The struggle is not over — rather, it is only beginning! Organizers from Jailhouse Lawyers Speak have expressed sincere gratitude and excitement about the number of solidarity demonstrations that have drawn mass attention to the National Prison Strike, and now ask that outside supporters change gears and focus on pressuring our representatives to acknowledge and act upon the ten demands of the Strike. On Friday, September 21 from 1:30pm-3:30pm, PSL Tallahassee will be hosting a Prison Strike Follow-Up event; lunch will be provided as we gather at Leroy Collins Public Library to write letters, call and otherwise contact our local, state and federal legislators about the National Prison Strike. There will also be a discussion on Amendment 4, which addresses the tenth demand of the Strike: the restoration of voting rights for formerly incarcerated individuals. It will take weeks to compile a full report on all the acts of resistance led by incarcerated people during the National Prison Strike. However, we can already tell that the 2018 Strike was a success; there has been unprecedented media coverage of the Strike and prisoners are finally being included in nationwide conversations about prison reform and abolition. 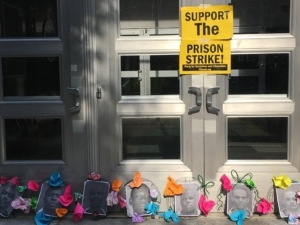 The prisoner-led movement is in its embryonic stages, and PSL commits to supporting our incarcerated comrades every step of the way in our protracted struggle against the prison-industrial complex. 4. The Truth in Sentencing Act and the Sentencing Reform Act must be rescinded so that imprisoned humans have a possibility of rehabilitation and parole. 5. No human shall be sentenced to Death by Incarceration or serve any sentence without the possibility of parole. 6. An immediate end to the racial overcharging, over-sentencing, and parole denials of Black and brown humans. Black humans shall no longer be denied parole because the victim of the crime was white, which is a particular problem in southern states. 7. An immediate end to racist gang enhancement laws targeting Black and brown humans. 8. No imprisoned human shall be denied access to rehabilitation programs at their place of detention because of their label as a violent offender. State prisons must be funded specifically to offer more rehabilitation services.